It was fun to lead worship today. It stretches me every time and that is good to get out of my comfort zone. Went to Wal-Mart today as the big family outing. I bought super glue and batteries. I was looking today at the members of the facebook group created in honor of my balding. It is funny who has joined since the last time I looked. Check it out! I caved in and took a nap today. You know I have been busy when a Sunday nap happens. Got to hang out with Sean and Melissa Spoelstra tonight. They are our ministry older siblings. I am so excited to watch them plant a church from our church next year and get to journey through it with them. God is going to use them in some big ways. I ate some bacon from the pig Kristin’s grandpa gave us today….sooo good! I found some old notes from my days as a student and teachers assistant at Grace College and CE National’s National Institute Youth Ministry major. Why Do Some Youth Leaders Not Use Games In Their Ministry? § Is there enough supervision? § Are there sharp objects in the area? § Is there any broken equipment? § Is the playing surface wet, clean, slippery…? § Is it acceptable to have older/younger or bigger/smaller students in the same game? § Is the game appropriate for the size of the group and the space provided for the game? § Do you have first aid kit? § Do you have a plan for a “worst-case scenario”? So last week you saw the presents my wife got me for my birthday. I also got some checks and way more stuff than I have ever got in my life…..and tonight it happened. 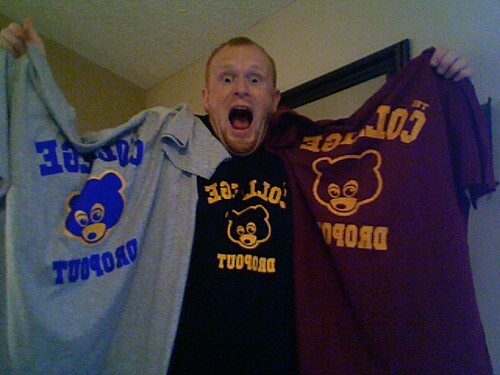 Brandon walked in the door and handed me not 1, not 2, but 3 pieces of Kanye West College Dropout merchandise. This is classic stuff that I have been eyeing and he made happen through a connection. I am as giddy as a school girl right now…….and so hood! Lots of guests coming through Casa De Artrip all the time. Tomorrow night I pick my brother and his wife up at the airport, next week Lexi (Oliver) Fretz will be here. I have been watching sooo much Making the Band 4 and Rob and Big on mtv.com recently. Malachi got some cool clothes that I get geeked about. My mom bought Malachi some Superman pajamas and Josh and Chelsea bought him some Nike Shox to wear to Liberty Soccer games. I have a huge homeowner/husband/father to-do list right now. Mostly stuff I have put on myself like laying a new patio to put my grille on. Anyone have a bike they want to give me? Malachi was in the car for like 4 hours today and handled it like a champ…that’s my little man! Why is it I always want more sleep? 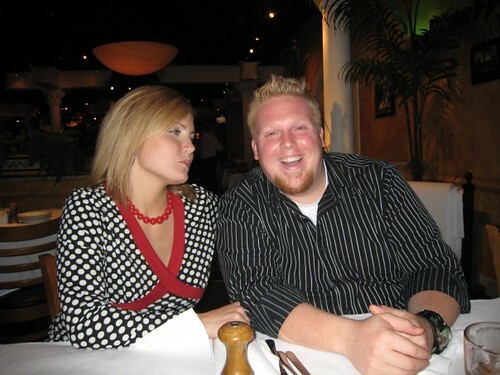 Justin Ross had this to say about me and some others he recently started linking to…“I consider these 51 people friends in ministry, even though I have never met most of them. I am fairly confident that if I were neighbors with anyone on the list we would swap house keys and share tools with each other.” Justin I can’t give you a house key, but we can link to each other and trade resources. Go check out Justin’s blog!